Banks are an essential part of the financial landscape – or at least, they’d like you to think so. But are they? New banking alternatives may be making the traditional bank loan a thing of the past. The traditional banking model has been around for centuries, supersized to today’s massive institutions like Bank of America, Citi and J P Morgan Chase – the ones deemed “too big to fail even when caught red handed in some shady and downright illegal activity in the wake of the financial crisis of a few years ago. The nation’s big banks were largely responsible for that crisis. Riding the expanding housing bubble, they underwrote massive numbers of highly risky loans that allowed unqualified borrowers to buy houses. But when those loans ballooned and the housing bubble burst, those unprepared borrowers were left with mortgages they couldn’t pay and houses lost to foreclosure. As the dust settled, details emerged about widespread abuses on the part of those big lenders, including the infamous ”robosigning” scandal that had banks using fake signatures to block process foreclosure paperwork – often on houses that weren’t up for foreclosure in the first place. Add in a seemingly never ending string of Justice Department investigations and lawsuits – some civil, some federal – against Bank of America and others, and legislation demanding better accountability and trust in the nation’s lending system fell to an all time low. That heightened oversight also meant new hurdles for borrowers. Lending standards tightened as banks tried to avoid penalties for writing bad loans. And interest rates and other fees made transactions more costly for many individual and small business borrowers. Even smaller banks felt the pinch, struggling under a new burden of regulations and oversight triggered by the sins of the big institutions. Most of us have been trained from childhood to see banks as friendly depositories for our cherished savings, but the real business of banks — how they make money – is in making loans. And big loans to corporations and international entities make the most money of all. Even in the best lending atmosphere, smaller borrowers may be left out in the cold, with more limited borrowing opportunities and higher rates – if they’re served at all. Enter a host of new alternatives such as monetary exchanges, peer-to-peer lending groups and crowdfunding sites. All these entities share one key feature: they offer a neutral ground for two interested parties to meet and conduct business. Borrowers can find lenders, sellers can find buyers, and individuals can join groups to spread the risk. Digital currency exchanges may be the best publicized of the new banking alternatives. A whole culture sprang up around virtually anonymous digital currencies such as the Bitcoin and similar monies like the Litecoin, which could be used in any transaction that two parties agreed on. Exchanges provide an interface between the world of digital currency and that of “real” money, offering users a way to convert from one kind of currency to another, buy digital coin and conduct transactions without much of a trace. Much beloved by users in parts of the world that lack stable currencies of their own, the Bitcoin and others like it have survived a few dings to the image from links to online drug trafficking sites like Silk Road to achieve a relatively stable status as a legitimate kind of currency. Peer to peer lending groups, made easy by the Internet, take the spirit of social media to the investing world. Entities like Lending Club cater to those small businesses and individuals who find it tough to get loans from established banks. These new lending alternatives position themselves as lending marketplaces, where people looking for investment opportunities and those needing funding come together. Like an online dating site, once the two parties meet up, they’re on their own. And while the sites advise participants to exercise due diligence, they don’t monitor the transactions once the parties agree to conduct business. Crowdfunding takes the process a step farther. Sites like EquityNet, Crowdfunder, IndieGoGo and even Kickstarter let individuals and enterprises get projects that need funding in front of potential investors and supporters. There are no fees involved, and the project creators are free to set any terms they wish. Transactions are one time only and don’t ‘involve much by way of traditional lender paperwork. When the bank says no, these options give startups and new entrepreneurs a foothold for launching enterprises of all kinds, from buying real estate to creating a boutique baby shop. Advocates of the new lending and money exchange models say they return the power to the people, bypassing lender fees and restrictions to allow two parties to agree on their own. They stimulate economies too, by helping launch startups and encouraging investment. And by focusing on doing one job and doing it well, they avoid much of the fraud and manipulation that came to light with traditional banks. The downside, say critics, lies in the most prized aspects of peer-to-peer transactions. 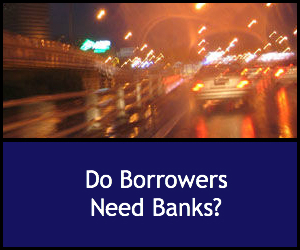 Though they’re completely independent of the banking system, they also lack the safeguards around traditional lending. Both parties are largely on their own if the deal goes bad. And the anonymity promised by Bitcoin exchanges and other sites means it can be hard to track illegal transactions and fraud. Cohen, William. “Bypassing the Bankers.” The Atlantic Business. Atlantic.com 13 Aug 2014. Money Talks – But What Does It Say?